In the introduction to her autobiography The Downing Street Years – abridged here – Margaret Thatcher indicts Socialism for its failure to be efficacious. Writing that successive post war Labour Governments began a sustained attempt of a centralizing, managerial, bureaucratic, interventionist style of government. It levied high rates of tax on work, enterprise, consumption, and wealth transfer. It planned development at every level – urban, rural, industrial and scientific. It managed the economy,macro-economically by Keynesian methods of fiscal manipulation,micro-economically by granting regional and industrial subsidies on a variety of criteria. The private sector is controlled by government, and the public sector isn’t controlled by anyone. The gentleman in Whitehall really does know better what is good for the people than the people know themselves. Such a philosophy was explicitly advocated by the Labour Party. It had a vision of the future: Britain as a democratic socialist society third way its principles and its policies both tending towards the expansion of government. The Tory Party was more ambivalent. At the level of principle, rhetorically and in Opposition, it opposed these doctrines and preached the gospel of free enterprise with very little qualification. Almost every post-war Tory victory had been won on slogans such as ‘Britain Strong and Free’ or ‘Set the People Free’. But in the fine print of policy, and especially in government, the Tory Party merely pitched camp in the long march to the left. It never tried seriously to reverse it. We boasted of spending more money than Labour, not of restoring people to independence and self- reliance. The result of this style of accommodationist politics, as Keith Joseph complained, was that post-war politics became a ‘socialist ratchet’ – Labour moved Britain towards more statism; the Tories stood pat; and the next Labour Government moved the country a little further left. The Tories loosened the corset of socialism; they never removed it. 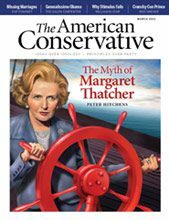 Peter Hitchens wrote an article for The American Conservative with the title: The Myth of Margaret Thatcher. He begins his article with reference to the film The Iron Lady, which he thought to be a cruel portrayal of Margaret Thatcher, making much of her decline into bemused old age. While it aroused sympathy for her among the undecided, passionate sympathy among those who already revered her, her enemies—the unintelligent, intolerant left—continue to hate her. Writing that with such people attacking her, it is hard not to rally to her side. But what about those of us who have an uncomfortable and growing suspicion that she was not as good as she is made out to have been? I am one of them. I still cannot resist the feeling that her reputation is not just inflated but damaging to the conservative cause. Peter Hitchens concludes with: But at the end of it, she was a great and noble failure, who forgot or ignored half of what she really needed to do, and so lived to see almost all her successes negated. And until conservatives in Britain and America are ready to recognize that, they too will fail, over and over again. Note: The abridged version of the introduction to Margaret Thatcher’s autobiography The Downing Street Years was first used by me in the post A Socialist Thatcherite? I have recently found a reference to to the quote by Douglas Jay and it seems that , as in all things political, one should really question the motives behind what is said. In this case and as used by me, a quote used to discredit ‘socialism’. In his book The Socialist Case, first published in 1937, Douglas Jay wrote: ‘in the case of nutrition and health, just as in the case of education, the gentleman in Whitehall really does know better what is good for people than the people know themselves.’ This phrase became notorious, and, as a result, Jay’s views on economic planning and consumer choice have frequently been misrepresented. Far from wanting to dictate to people what they should consume, Jay was a planning sceptic who believed that the price mechanism had many virtues. The experience of World War II, however, convinced him of the merits of central planning, and this was reflected in key changes he introduced to the new edition of The Socialist Case, published in 1947. The changed role envisaged for Jay’s ‘gentleman in Whitehall’ not only illustrates important points about the impact of war on the Labour Party’s attitudes to planning and consumer sovereignty, but also casts light on the relationship between the socialist revisionism of the 1930s and that of subsequent decades.